Behind the friendly laid-back facade of Darwin, Australia’s northern capital, a crocodile roams the waterways in search of revenge and evil ripples in the hearts of humans. The suicide of Cody Bongiorno is devastating to those left behind. But was this gentle young man manipulated into taking his own life? Is there a link between Cody’s death and the horrific crocodile attack on his comical friend, Jerry Lucas? Following on from her stunning success in solving the murder of a famous Byron Bay resident, amateur sleuth and investigative journalist Dusty Kent is once again determined to bring resolution to the families left behind in the wake of these tragedies. 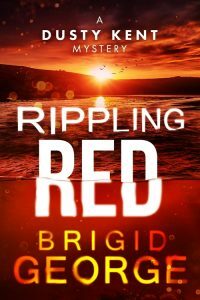 Rippling Red, the third novel in the Dusty Kent murder mystery series, unfolds against a backdrop of spectacular sunsets as layers are stripped away to reveal twists, surprises, shocking truths and finally, the dark secrets that lie beneath still waters. Brigid George is the pen name of JB Rowley, author of Amazon #1 best sellers Whisper My Secret and Mother of Ten.